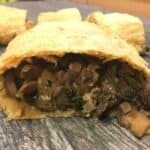 Baked, Flaky Mushroom and Spinach Struedal is elegant and savory. Sauté onions, shallot and garlic until onions are translucent. Sauté for 15 to 20 minutes until brown. Add vegetable broth and continue stirring. Add garlic powder and fresh ground pepper. Add soy sauce and wine. Continue cooking over medium heat until there is no fluid remaining. On a lightly floured surface, roll out puff pastry slightly. It should increase by an a few inches in length. Do not roll out too much; you don’t want it too thin. 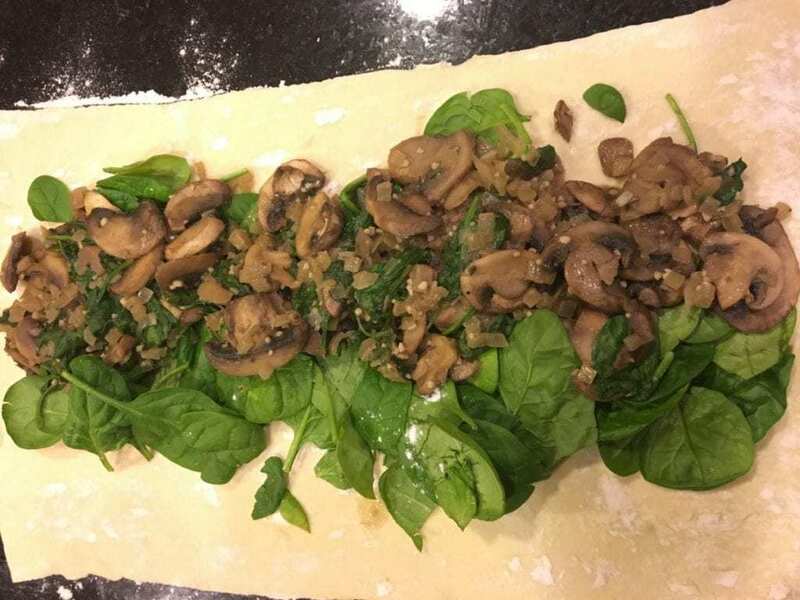 Using fresh spinach (NOT COOKED), cover the middle of the puff pastry with spinach. Add the mushroom mixture down he center of the puff pastry. Using a fork, seal along the length and ends. Using a spatula, carefully move the strudel onto a baking sheet lined with a silicone mat or parchment paper. Bake at 375 degrees for 35 minutes on a cooking sheet lined with a silicone baking mat or parchment paper. I served with Buttery Butter Bean Mashed Potatoes and ‘No’Chicken’ Gravy.